As the price of North Sea Brent crude oil touched $125 /barrel last week, the topic of sharply higher gasoline prices suddenly caught the attention of the Main Stream Media (MSM). Spin artists for the re-election campaign of President Barack Obama were quick to deny any responsibility for soaring oil prices, and instead blamed the upward spiral on geo-political tension with Iran. However, since the days of the Yom Kippur War in October 1973, - when the OPEC cartel placed an embargo on crude oil sales and hiked oil prices by 70%, the price of gasoline has been a key variable effecting the outcome of US-presidential elections. In nine of the last ten US-presidential elections, if the price of gasoline was higher at the end of the incumbent's term in office, than when it began, the incumbent lost the election. The only exception to this trend was in 2004, when the average price on Election Day was $2.03 per gallon compared to $1.54 four-years earlier. George W. Bush won reelection, but just barely, 51% to 49-percent. Since Obama took office, the average price per gallon had doubled to $3.70 and is 43-cents higher than a year ago. It's up 23-cents just in the month of February. Most analysts say gasoline prices could climb to $4 a gallon, as US-refiners switch to a more expensive blend of petrol for summer driving. But regardless of the cause, the president of the United States gets an inordinate share of the blame anytime there is a spike in gasoline prices, dating back to the Carter administration. While the president is punished in the court of public opinion whenever gasoline becomes too expensive, he receives no reward when gasoline prices are relatively low. If a spike in gasoline prices is sustained for an extended period of time, it usually has a ripple effect of fueling broad based inflation, and begins to chip away at the president's popularity. Given the fragility of the Euro-zone's economy, - the world's largest trading bloc, the latest upward spiral in the price of North Sea Brent to an all-time high of €93.35 /barrel, is threatening to tip a mild recession into a deeper downturn. And because Europe buys about 20% of US-exports, and US Multi-Nationals earns about a quarter of their revenue from affiliates located in Europe, a deeper economic downturn on the eastern side of the Atlantic Ocean could derail the fledging US-economic recovery. Right now, the balance between global supply and demand is razor thin. Global oil production was 90.2-million barrels/day (bpd) in January, or about 700,000-bpd more than global demand. Saudi Arabia holds about 2.5-million bpd of idle production capacity to meet any sudden shortages, - the world's only significant unused capacity. As US gasoline prices have become a top political issue in the run-up to the 2012 presidential elections, Senator Charles Schumer, asked secretary of state Hillary Clinton to urge Riyadh to increase its oil production to full capacity of 12.5-million bpd - an increase of 2.5-million barrels, in order to calm the oil markets. "These skyrocketing fuel prices are directly linked to the global energy market, particularly Iran's recent efforts to manipulate oil prices and the worry of impacts on supply from an escalation of regional hostilities," Schumer said in a letter. However, Emerging giants India and China are increasing their purchases of crude oil. China imported 23.4-million tons of crude oil last month,the third highest amount on record, and up +7.4% from a year earlier. India ramped up its purchases of crude oil to 17-million tons, up +18.6% from a year earlier. China wants to build its strategic reserve of crude oil, which presently stands at 102-million barrels - 21-days of imports. It's scheduled to add another 168-million barrels of storage facilities by early 2013. If filled at a steady pace China would need to secure an additional 220,000 barrels per day, - not including any incremental increases in demand for economic growth or from falling domestic production. Indentifying the precise threshold of pain at which a Global "Oil Shock" wrecks havoc upon the fragile Euro-zone economy is tricky, but crude oil prices are quickly approaching the danger zone. Treading above the 2008 highs is certainly as warning sign of trouble looming on the horizon, especially if prices continue to march upwards. From a strictly technical point of view, the outlook for North Sea Brent is Bullish - climbing higher along an upward sloping trend-line. In the olden days, - before the collapse of Lehman Brothers and the financial crisis of 2008, central banks would've moved to tighten their monetary policies, and hike interest rates, in a concerted effort, in order to combat the inflationary impact of sharply higher oil prices. But in today's world of "Quantitative Easing" (QE), a tighter money policy is no longer an option, especially with a US-presidential election, scheduled for Nov 6th. Nowadays, the Fed can only display its hawkish credentials, by fending off demands of the ruling politicians for a third round of QE. That still leaves the Fed looking timid and weak in the eyes of speculators. Throughout the first three years of the Obama administration, the Fed has pursued the easiest money policy in the nation's history. The Fed has locked the federal funds rate at 0.25%, and has vowed to maintain its Zero Interest Rate Policy (ZIRP) through the end of 2014. With its $400-billion "Operation Twist" scheme, the Fed has pushed the Treasury's 10-year yield below 2%, a historic low. President Obama has exerted enormous pressure on the Fed to inflate the value of the US-stock market by Election Day, by printing vast quantities of money, in order to create the perception among the unsuspecting public that an economic recovery is underway. Obama and his spin artists are pointing to the rising stock market in campaign speeches and before audiences tuned into the MSM around the country, as a sign of optimism about the future, and a reason to vote for Obama in November. The problem of course, is that QE is only widening the gap between the rich and the poor in the United States. In fact, the top-10% of the wealthiest Americans own 80% of the stocks that are listed on the NYSE and Nasdaq. So in essence, most of the financial gains of the past three years have gone to the upper echelon of society. This policy known as "trickle down" economics, - is enriching the top-10% of the wealthiest Americans, and hopefully, they'll spend more of their new found wealth. That in turn, would generate more demand for goods and services in the economy. This trickle down policy has damaging side effects though, which is why 60% of Americans think the US-economy is still in recession, according to a recent Rasmussen poll. For most Americans, the cost of living is rising faster than their wages. One major problem that's now cropping up for the Obama re-election campaign, is that the price of North Sea Brent crude oil, - the benchmark for 2/3's of the world's oil markets, - appears to be tightly pegged to the direction of the Dow Jones Industrials. As the Fed inflates the value of the stock market, with its ultra-easy QE money policy, - one of a dangerous side effects is sharply higher oil prices. If the Fed is aiming to inflate the value of the Dow to the 14,000-level in advance of the upcoming presidential election, as is widely expected by equity traders, it also runs the risk of jettisoning oil prices to $150 /barrel. Several members of the Bernanke Fed are addicted money printers, and are itching to unleash QE-3, - flooding the markets with an extra $500-billion to $1-trillion of freshly printed greenbacks. "It's vital that we keep the monetary policy throttle wide open," said San Francisco Fed chief John Williams on Feb 14th. "That will help lower unemployment a little bit quicker, and raise inflation back toward levels consistent with our mandates. And importantly, we want to do so quickly to minimize total economic damage," he added. The Fed routinely drops hints to the financial media, that it would quickly unleash QE-3, if the US-economy shows any signs of faltering, to keep the stock markets propped-up. On February 2nd, Republican Congressman Paul Ryan, from Wisconsin blamed the Fed's radical monetary experiments for eroding the purchasing power of US-citizens' savings, creating a false sense of security in the stock markets, and manipulating the long end of the yield curve. "The Fed is putting a cap on price discovery and creating a false sense of security by keeping rates low. I think this policy runs the great risk of fueling asset bubbles, destabilizing prices and eventually eroding the value of the dollar. The prospect of all three is adding to uncertainty and holding our economy back," Ryan argued. However, Ryan's arguments fell on deaf ears, since Bernanke's tenure at the Fed is tied to the fate of his boss - President Obama, and there's no chance of reversing nuclear QE this year. However, Bubbles are now starting to show-up in the crude oil market. Investment demand by speculators and hedge funds, utilizing "black gold" as a hedge against the ultra-easy money polices of the central banks, is on the rise. On the New York Mercantile Exchange, traders have raised their bets on rising oil prices by 25,273 contracts to 259,162, the CFTC said. Net longs in New York are up by more than 53,000 in the past two weeks and have risen by more than 110,000 since October.Interestingly enough, the Chicago Mercantile Exchange cut initial margins on Nymex crude oil by -9% to $6,885 a contract from $7,560. The exchange operator also trimmed initial margins to trade Brent to $7,425 per contract, from $8,100. (Look for the Obama team to crack down on the CME, and demand that the exchange reverse its decision, and ask speculators to pay higher margins to hold oil positions). As a result, there are early signs that the upward spiral in gasoline prices is already beginning to chip away at Obama's approval rating, as measured by the Gallup polling organization. Obama's approval rating has tumbled by 4% in recent weeks, to only 44% today, according to Gallup. 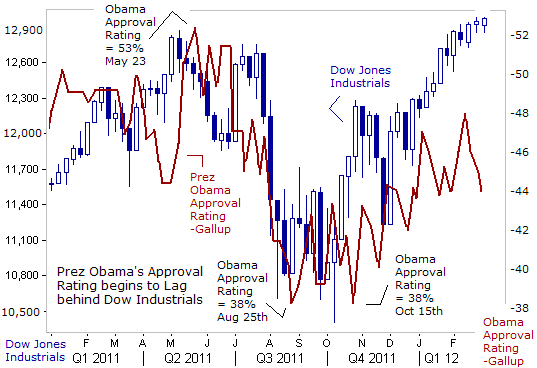 Until Feb 9th, Obama's approval ratings were tracking the direction of the stock market, albeit with a lag. However, the latest 23-cent spike in gasoline prices might be taking its toll on the president. In the latest Rasmussen Reports daily tracking survey released Feb 27th, Obama has begun to shed his recently rebounding job approval, 26% of the nation's voters Strongly Approve of the way Obama is performing, compared to 42% that Strongly Disapprove, giving Obama a Presidential Approval Index rating of -16-percent. That's the president's lowest rating in over a month. Rasmussen notes that for the first time since December, 2011, Romney leads Obama 45% to 43-percent. Romney is leading the president among "unaffiliated voters" by 9-points. Gallup shows Romney leading Obama by 50% to 46%. These two pollsters, - Gallup and Rasmussen, are considered to be unbiased in their reporting, in sharp contrast to news organizations from the far-left of the political spectrum, that support the Obama re-election campaign, and show Obama leading the Republican field by a wide margin. Ominously, no American president has won re-election in modern times, when his approval rating was less than 47-percent. Sensing political flak from the Republicans, Obama tried firing back with some political rhetoric of his own. "Anybody who tells you that we can drill our way out of this problem doesn't know what they're talking about or just isn't telling you the truth. The United States consumes more than a fifth of the world's oil, more than 20% of the world's oil, just us. We only have 2% of the world's oil reserves. We consume 20%. That means we can't just rely on fossil fuels. The American people aren't stupid. They know that's not a plan - especially since we're already drilling. That's a bumper sticker. It's not a strategy to solve our energy challenge. That's a strategy to get politicians through an election. You know there are no quick fixes to this problem. You know we can't just drill our way to lower gas prices," Obama said. 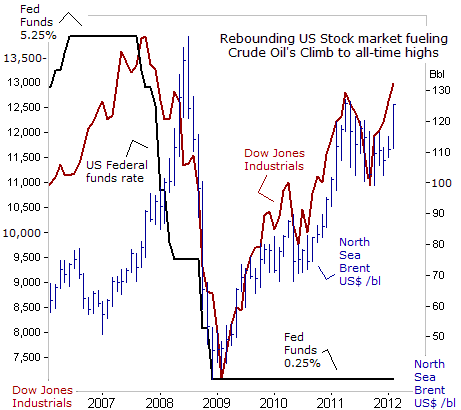 Luckily for Obama, the Republican candidates haven't yet recognized the biggest culprit behind the upward surge in crude oil prices - is the Fed's ultra-easy money policy, - which weakens the US-dollar and encourages risk taking in commodities, precious metals, and equities. The Fed has gotten a free pass. Even the Fed's biggest critic, Texas Congressman Ron Paul has been silent about the link high gasoline prices and the Fed's massive expansion of the high octane MZM money supply. Instead, the blame for higher oil prices is shifted to fears that Iran's leaders might try to shut down the Strait of Hormuz, if the European nations and the US continue to tighten economic sanctions on Iran's commercial dealings. Although the Fed is the primary culprit behind the rise in crude oil, other central banks are also responsible for the pain that motorists are feeling at the pump. 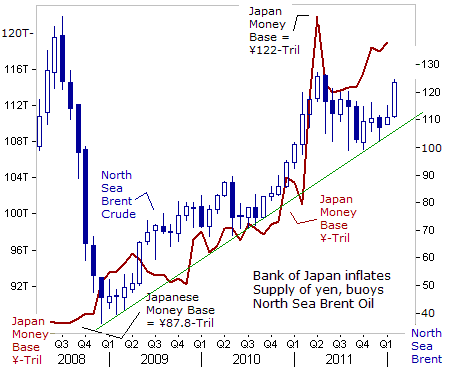 The Bank of Japan (BoJ) for instance, has increased the supply of yen in the Tokyo money markets, by 30-trillion yen, ($385-billion) over the past three years. In turn, Japanese banks lend yen to speculators at borrowing costs of just 0.10-percent. That encourages "Yen Carry" traders to borrow funds in Japanese yen, and to utilize the cheap money to initiate positions in crude oil and Tokyo gold futures. On Feb 14th, the BoJsurprised the currency markets, by bending to heavy government pressure, and agreed to further inflate its monetary base by an additional ¥20-trillionby year's end. 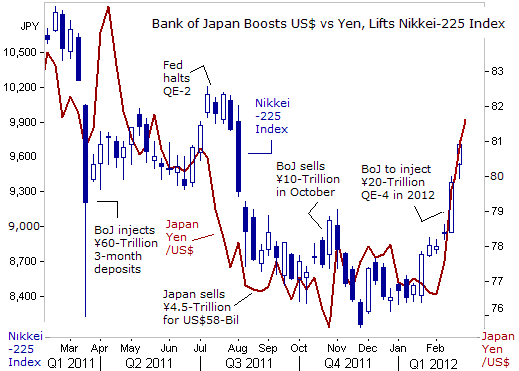 Once the BoJ's QE-4 scheme begins to fully blossom, it could single handedly lift crude oil to $135 /barrel. Tokyo argues however, that its QE-4 scheme is a legitimate response to its ever worsening trade balance, and the debilitating impact that a super-strong yen is having on its economy. Japan's trade deficit grew to ¥1.48-trillion ($18.9-billion) in January, the highest since records began in 1979, andmore than triple last year's shortfall of ¥479-billion. Imports surged +9.8% to nearly ¥6-trillion, with natural gas purchases shooting up +74% and coal rising �percent. Japan posted its first trade deficit in 31-years in 2011, as the nuclear disaster raised the country's dependence on imported fuel. Japan's Finance chief Jun Azumi said the BoJ has agreed to +1% inflation target, meaning the central bank would likely unleash QE-4 at full throttle, - injecting ¥20-trillion by year's end, until the Tokyo's top financial objectives are met. The top priorities are weakening the Japanese yen's value compared to the Euro and US-dollar (ie fueling the yen carry trade), and inflating the market value of the Nikkei-225 index. During the month of February, Tokyo was extraordinarily successful in lifting the US-dollar by 5-yen to as high as 81.60-yen, and thereby helping to ignite a +14% rally for the Nikkei-225 index. Obama's efforts to address American motorists' latest pocketbook heist, spoke volumes about the danger signs in recent polling, plus his campaign's determination to rebut Republican criticisms in real time, even though the general election is still months away. Obama and his re-election team believe any new drain on voters' wallets into the spring and summer could prove costly at the polls come November. Gas prices nationally are the highest ever for this point in the calendar -- still well before the summer driving season when prices typically rise. The added costs for businesses and consumers could stall the economic recovery, just when the country is more optimistic that recovery has been taking hold. However, a major part of Obama's dilemma is the European Central Bank's recent decision to massively increase the supply of Euros in the banking system. ECB chief Mario Draghi is urging banks to lend the money they borrow from the ECB at 1% interest rates to Euro zone households and businesses. 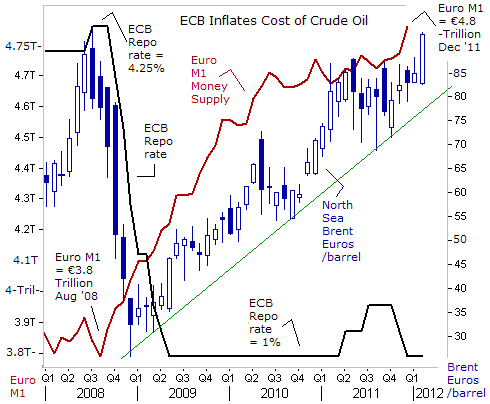 On Dec 21st, the ECB lent €489-billion ($658-billion) for three-years to 523-banks. A second tranche will be made on Feb 29th, and the ECB chief said he hopes the banks would lend the funds to customers and expand credit in the real economy. However, the banking Oligarchs can either decide to hoard the cash, buy Euro-zone sovereign bonds, precious metals, or speculate in commodities, such as crude oil. 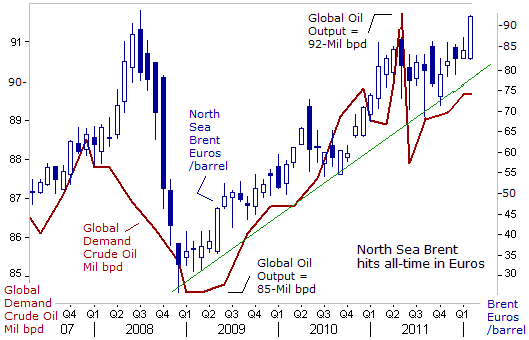 So far, the rally in North Sea Brent has been largely fueled by monetary easing in the West and Japan. The rising tide of liquidity is pushing up stock markets and commodities across the globe. While the leading commodity gauge, the Thomson Reuters CRB Jefferies index, has climbed 6% so far this year, crude prices have jumped faster, rising 16% in the same period. Similar forces lifted oil prices to $127 /barrel last year, after Libya's 1.6-million bpd of oil output was crippled during the uprising against the 41-year rule of Moammar Gadhafi. Fears of global demand destruction owing to plunging stock markets in the summer, had subsequently cooled oil prices, but the North Sea Brent never fell below $100 /barrel. President Obama has exerted enormous pressure on the Fed to inflate the value of the stock market ahead of the upcoming election. The US-dollar's resulting weakness against the yen forced Tokyo to begin unleashing QE-4, to counter the lingering effects of the Fed's QE-2, and the ECB's upcoming QE-2 money printing spree. Despite softer Chinese economic growth, its demand for oil continues to be resilient. China is due to overtake the United States as the world's biggest oil importer within 18-months. So far, global stock markets haven't shown much fear or trepidation to oil prices trading at $125 /barrel. That's because markets are heavily sedated with massive dosages of liquidity. Furthermore, not a single central bank in the world is contemplating a tighter monetary policy. Instead, central banks in the developed and emerging nations are expected to inject additional rounds of liquidity to energize their economies. These QE schemes could start to boomerang, if the "crude oil vigilantes" are able to punish central bankers for creating too much money, and smack politicians for creating too much debt, - by jacking-up oil prices to $150 /barrel. If Europe and the US continue to tighten economic sanctions on Iran, to a point of significantly wrecking havoc upon the Iranian economy, oil traders could seize any verbal threat by Tehran regarding the Strait of Hormuz, as a chance to jack-up oil prices. Some 40% of all seaborne oil passes through this narrow passageway, amounting to 17-million barrels per day.However, under international maritime law, Iran along with Oman has sovereign territorial rights over these waters. Iran has under United Nations law agreed to grant ‘innocent passage' to ships through its waters provided there is no infringement of its security. Although Tehran customarily follows the "Law of the Sea," it's not legally bound by them. 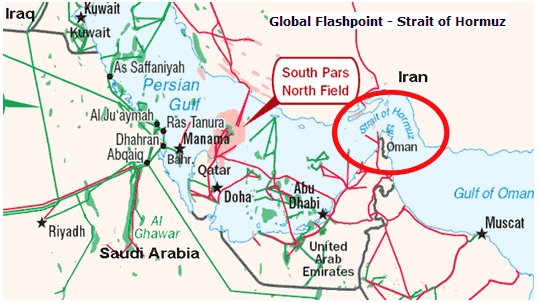 The Iranian Regular Force Navy and the Iranian Revolutionary Guard Navy monitor and police the Strait of Hormuz, and could effectively shut down traffic for weeks until the US Navy could establish safe passage. Whatever the case, crude oil vigilantes can use the tension with Iran as a convenient excuse to bid-up the price of oil, and sustain the spike in gasoline prices. If correct, soaring gasoline prices could sink Obama's popularity and his re-election bid. "Oh what a tangled web we weave when first we practice to deceive,"-- Sir Walter Scott. 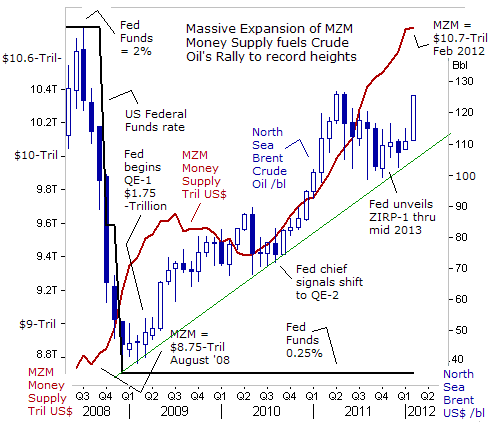 This article is just the Tip of the Iceberg of what’s available in the Global Money Trends newsletter. Subscribe to the Global Money Trends newsletter, for insightful analysis and predictions of (1) top stock markets around the world, (2) Commodities such as crude oil, copper, gold, silver, and grains, (3) Foreign currencies (4) Libor interest rates and global bond markets (5) Central banker "Jawboning" and Intervention techniques that move markets. Copyright © 2005-2012 SirChartsAlot, Inc. All rights reserved.